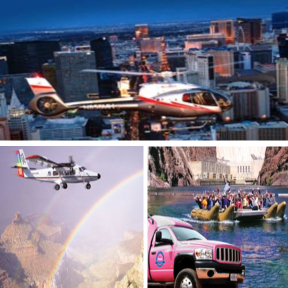 Visit Red Rock Canyon National Conservation Area - located within the Mohave Desert and only 17 miles west of the Las Vegas Strip, making it the ideal choice for a short day trip adventure. The beautiful rock formations that are a part of Red Rock Canyon are comprised of Aztec Sandstone, sand dunes that formed in the desert that covered a large part of the southwestern United States during the Jurassic time period. There are two attractions located within Red Rock Canyon National Conservation Area, Bonnie Springs Ranch and Spring Mountain Ranch State Park. Both ranches are worth the visit if you have the time to fit them into your vacation. Red Rock Canyon is located west of Las Vegas on W Charleston Blvd/SR 159. Charleston is a major east/west street that can be accessed from any north/south surface street or from the 215 Beltway. Visitors should proceed west on Charleston. The boundary for Red Rock Canyon is approximately two miles west of the 215 Beltway/Red Rock Casino. The Red Rock Canyon Visitor Center is located approximately four miles west of the park boundary and will be the second road that exits to the right. When you visit Red Rock Canyon, there is plenty to do and see during your visit. Take a tour along the 13-mile scenic drive, explore the hiking trails, or enjoy the activities that are available: horseback riding, mountain biking, road biking, and rock climbing. There is a visitor center with indoor and outdoor exhibits as well as a book store. When you visit Red Rock Canyon, keep in mind there are 19 different hikes and trails that take you from the deep canyons to the highest points of Red Rock canyon. Triassic fossils and various desert flora can be seen on this open country trail which starts at the visitor center and traverses a prominent limestone ridge. This trail runs along the base of the Calico Rocks from Calico Basin to Sandstone Quarry. This scurry over jumbled sandstone leads to a hidden water pocket and a great view of Las Vegas. This hike features sweeping views from a choice Red Rock Canyon peak. Although it’s not an easy climb, Turtlehead Peak is one of the most accessible peaks. Hike along this trail to see the intersection of great and colorful geologic eras. Sixty million to 65 million years ago, the Pacific and North American continental plates got into a shoving match. The conflict pushed up the Sierra Nevada Mountains to the west. From the upper parking lot at White Rock Spring, take the trail on the west side to where it splits. This loop takes you through a secluded pocket of life, around the rugged sandstone of Red Rock Canyon to La Madre Spring, where the water splashes life on this otherwise desert landscape. This self-guided interpretive trail introduces kids of all ages to the many different features of the Mojave Desert at Red Rock Canyon, including petroglyphs, lessons of desert life, towering views, and a hidden waterfall in the canyon. From the parking lot follow the trail by the restroom south. This takes you past a pictograph site and Agave roasting pits, to the Lost Creek parking lot. This nice hike follows an old road up a canyon with red and white sandstone cliffs on one side and gray limestone mountains on the other. SMYC stands for “Spring Mountain Youth Camp,” which is a long-term correctional facility for young men. This is a pleasant trail with relatively little elevation change that generally runs at gentle grades. Ice Box Canyon is a good hike for a hot day. The trail takes you through a cool, shady box canyon with seasonal waterfalls in the heart of Red Rock Canyon National Conservation Area. Dale’s Trail is a 2 .1 mile segment of the Escarpment Route that runs through open desert along the base of the Wilson Cliffs. Pine Creek Canyon offers some of the best of the Red Rock Canyon National Conservation Area–beautiful and diverse plant communities nestled at the bottom of monolithic canyon walls. This easy, .75-mile loop trail runs out into Pine Creek Wash through an area where the BLM performed a prescribed burn in 1997 to clear brush and reduce the chances of a catastrophic wildfire that might kill the tall ponderosa pines in the wash.
Oak Creek Canyon is one of several beautiful canyons cutting into the Red Rock escarpment. The Arnight Trail is a 2.4 mile segment of the Escarpment Route that runs through open desert along the base of the Wilson Cliffs. There are many small boulders on the little ridge that make for a nice place to stop for lunch. If you are looking for a hike to a peaceful, shady area, visit Red Rock Canyon's First Creek Canyon Trail. This is a pleasant 3-mile walk across a desert valley to a little waterfall with cottonwood trees, willows, and other shade trees. Climbing is becoming increasingly popular in Red Rock Canyon. Great boulders and sheer rock faces bring climbers from around the world. There are routes of interest to both the beginning and advanced climbers. If you would like to contact any of the climbing staff at Red Rock Canyon, call (702) 515-5358. Bicycling in Red Rock Canyon National Conservation Area is an enjoyable way to see the local flora and fauna. The structural details of the massive sandstone cliffs, the area’s most notable feature, are impressive when seen from a bicycle. One-way regulation on the scenic drive applies to cyclists as well as those driving motorized vehicles. The one-way loop (14.7 miles round trip, including highway portion) offers an excellent workout for the experienced rider. Visitors wishing to explore Red Rock Canyon on horseback can bring their own horses or take advantage of the permitted guided equestrian tours. Red Rock Canyon National Conservation Area has one developed campground. Opened in 1998 to replace the Old Oak Creek Campground, and formerly known as the 13-Mile Campground, the Red Rock Canyon Campground is located two miles east of the visitor center on W. Charleston Blvd (State Route 159). The campground is located one mile south on Moenkopi Road from the junction with W. Charleston Blvd. It is not suggested to arrive in the middle of the night in the hopes of locating an empty campsite, especially during the fall and spring. The Thanksgiving and Christmas holiday periods are also very busy as are other holiday weekends. The Red Rock Canyon Campground is open Labor Day weekend through Memorial Day weekend. Reservations are only accepted for group sites, individual campsites are available on a first-come, first-served basis. Call (702) 515-5350 for more information. Red Rock Canyon National Conservation Area is a United States Government Amenity Fee Area administrated by the Bureau of Land Management. Rates and acceptable passes can be purchased at the entry station with proper identification. The RRCNCA Fee Station accepts cash, domestic checks, and all major credit cards. The Visitor Center is open every day from 8:00 AM to 4:30 PM. Operating hours will vary on Thanksgiving, Christmas Eve, Christmas, New Year’s Eve and New Year’s Day. Call (702) 515-5350 for operating hours on these holidays. Spring: Cool with clear skies and still the remnants of winter hanging onto the leaves in Ice Box Canyon. Summer: Scorching temperatures ranging well into the 100’s. Only the strong survive during a desert summer. Fall: Find yourself near water and you’ll be surrounded by the yellowing leaves of Autumn. Winter: Even in the desert the mountains of Red Rock Canyon are blanketed with snow.